On Day Three of British Flowers Week: Discover all about Pinstripe and Peonies' favourite British summer flower, the stock! The stock derived its Latin name from botanist Robert Brown (he of Brownian motion, no less), who named it in honour of doctor and naturalist Pietro Andrea Mattioli. Stocks were known as gillyflowers in the Elizabethan era, and since Victoria times have become one of the most widely grown cottage garden perennials. One of the key strengths of the stock for an event or bouquets is its strong, spicy, sweet clove fragrance that can fill a room with the scent of summer. The clusters of single or double flowers in a broad palette of warm colours are born on tall, strong stems of 35-60cm. Throughout the summer, you can find British stocks of excellent quality in pure shades of white, cream, pink, red, yellow, lilac and purple. 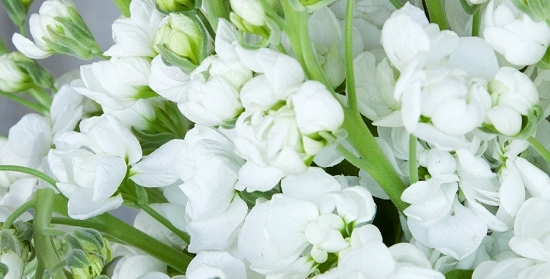 "Stocks are a fantastic British summer flower to use in events, arrangements or bouquets. Their perfume is just delicious and the range of colours makes them so easy to use for all sorts of jobs," says Ruari McCulloch of Pinstripes & Peonies, who selected the British stock as his favourite British flower for British Flower Week. To see images of the work created by Ruari McCulloch of Pinstripes and Peonies for British Flowers Week, go here. With a bit of basic flower care, British-grown stocks have a potential vase life of weeks. All foliage below the waterline should be trimmed off, the stems recut regularly and the water replaced often to ensure maximum vase life. Most flower wholesalers at New Covent Garden Market offer stocks in quantity during the summer months, such as SR Allen, E Four, Zest Flowers, Pratley and Alagar. You can buy British stocks as boxes of single colours or mixed boxes, and as always, the early buyer catches the best flowers, with British grown flowers delivered mainly delivered for the Mondays and Thursdays every week.